Wow. Are we this far along? We have around 6 months left of trading in Western markets to protect or make enough money to offset future losses. Spend your time looking at the risks of custody, safekeeping, counterparty etc. Assume that no one and nothing is safe. After that……we put on our tin helmets and hide until the new system emerges. The source document for the quote and additional bio data for Pal is posted tonight at Zero Hedge. If Pal is right, we're about to run out of road to kick the can down. And the can's so beat up, it's not much good for kicking anyway. Governments and central banks may draw things out longer than many suspect they can. But even a cursory look at what's going on should suggest that current economic models simply aren't sustainable. A more to-the-point assessment might be to say the system's broken. And sooner or later, broken things stop working entirely. My great, great, great grandmother was a Hatfield. But best I can tell, she married and moved away from that Pike County crowd a generation or more before all that fuss with the McCoys. It's true. 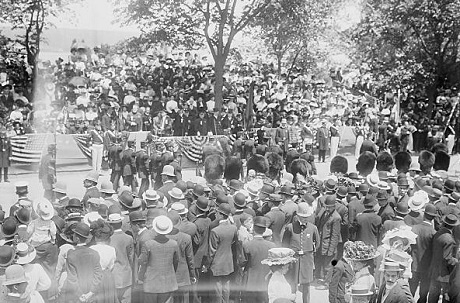 Mary "Emzy" Hatfield was the daughter of Ephraim and Anna Hatfield. Emzy married Coonrod Riffe, they had a son named Jeremiah. Jeremiah had a son named Lee who had a son named Edgar who had a daughter named Clara. And Clara grew up to be my mom. A couple of photos recently came to my attention. Each seems to use U.S. military personnel in uniform to push a practice, social cause or agenda. Many in America will see these two photos as harmless, but not everyone shares today's American values. Critics go bonkers when some soldier is snapped in a pic posed with a corpse on a battlefield or with an incarcerated Muslim, but photos like this might just as likely provoke a violent Muslim backlash against U.S. troops. If you're in the military or know someone who is, think before you exploit the uniform and the service it represents. And think doubly hard before publishing or posting questionable content on the web. Spotlight on Europe. Being able to watch a continent crumble doesn't happen very often. Here at home, Mitt Romney seems to have the delegates he needs, but I hear no collective sigh of relief that he's going to save us. There was an ugly gun ban scare this week. It's amazing how many people can be taken in when sloppy bloggers pick up a year old story and treat it like it's a current event. The country's political climate feels like a pot on slow simmer. Not hot enough to make you jump. Just warm enough to zap your energy and leave you lethargic and vulnerable if the trend continues and you don't have contingencies. Show starts at 1:00 pm EDT. Live callers welcome at 678-344-9926. Have a question or a comment before the show starts? Drop us a voicemail at 404-981-1775, or reach out on Twitter @TalkSouthRadio. Direct link to program audio. When something is broken, linking it to other broken or tottering entities seldom provides a long-term fix. The headlines are delivered with all the journalistic zeal of breaking news. But they sound little different from other zealous headlines we've been hearing for well over a year now. When you tie together a bunch of unsustainable economies, you just create a bigger mess. Looks to me like Europe remains on the fast track to a good hard dunk. When it does, I'm still sitting on the fence whether the U.S. gets hammered immediately or if we get a little pop as money flees Europe and seeks refuge in America. Whether it comes quick or takes a little time getting here, we've got more economic turmoil coming our way. And we've squandered way too many resources on extend and pretend, and too big to fail games rather than cleaning house and putting things on a more sustainable path. We feature ads for several good ammo vendors on the blog, but sometimes a special comes along from elsewhere that's too good not to share. If you shoot .32 acp, AIM Surplus has a deal on Fiocchi FMJ at just $9.95 per box of 50. A Memorial Day special, while supplies last, AIM says. Update: As of Wednesday (5/30/12), AIM's back to its old price of $10.95. Still cheap compared to what I see elsewhere. The United States prioritizes the right to keep and bear arms over the protection of citizens' lives and personal security and exercises lax firearm possession control, causing rampant gun ownership. The U.S. people hold between 35 percent and 50 percent of the world' s civilian-owned guns, with every 100 people having 90 guns (Online edition of the Foreign Policy, January 9, 2011). According to a Gallup poll in October 2011, 47 percent of American adults reported that they had a gun. That was an increase of six percentage points from a year ago and the highest Gallup had recorded since 1993. 1993. That's the year Bill Clinton barred Chinese arms maker Norinco from selling arms to the U.S. civilian marketplace. Are the Chinese still holding a grudge over that? David Codrea at the National Gun Rights Examiner has additional thoughts on the Chinese swat at our Second Amendment. Codrea notes it's much easier to carry out mass genocide when government has a monopoly on violence. It's all over the web. The ATF is moving to ban shotguns that hold more than five rounds, the warnings declare. I've seen it posted so many places. Here's one. And another one. Here's a chain: A Free Republic post links to site called the Tea Party Economist which then links to its source, something called the Greeley Gazette. In fact, all posts that cite their source seem to track back to the Tea Party Economist and then back to the Greeley Gazette. But if you go to the Gazette's link, you'll see the root post is over a year old. And yes, the Gazette was right. Back then, there actually was something afoot. In January 2011, the ATF released a study and made a pitch to ban importation of some tactical shotguns. And the ATF sought public comment. There was a huge public uproar, the ATF left the proposal to die quietly. In fact, Congress has since acted to protect shotgun imports. Bottom line, I see no need for alarm here. And it's kind of disappointing to see so many failed to vet an issue before sounding another wave of alarm. I'd rather deal with stuff that's really on the table than be distracted by something that an alert public successfully pushed off the table and defanged a year ago. That said, if anyone has specific current information that the ATF or the DOJ or the White House has pushed or will shortly push for additional firearms restrictions, I'm all ears. Otherwise, I'm spending my time on other stuff - including the vetting of candidates in upcoming congressional, state and local primaries. Gunshots wound more than 40, kill at least 10. Also, Second City Cop says gang trouble surfaced again along a city beach. Maybe by this time next year, Mr. Obama will have returned to Chicago so he can join Rahm in getting their city under control. (6) An estimate of the total public burden (in hours) associated with the collection: There are an estimated 1,058 annual total burden hours associated with this collection. The proposal doesn't specify dealers. My assumption is the data collection applies to any holder of a firearms license including Curio and Relic licenses (If anyone knows more, feel free to chime in). While this notice posted in the Federal Register seems routine, could public comments received by ATF be used as a spring board for additional regulation? Public comment on the proposal ends June 1. Rep. Allen West (R-FL) says there's a lot to like in Obamacare. Liberal ThinkProgress has a video of West saying so. Huffington Post has reported the same in early April. But word didn't spread to conservative outlets. Why not? If Allen West speaks for the Tea Party Republicans, does anyone still think the GOP is serious about repealing Obamacare? West makes it sound like Republican intent may be to slap some lipstick on is, call in something else, and carry it forward. Even if Republicans score big wins in November, don't expect them to significantly change the course the country's on. November's ballot increasingly looks like a choice between Status Quo Party D and Status Quo Party R. What we need is a Shake It Up Party. How bad off is Europe? The bottom line is that if Greece leaves the Euro, the contagion will spread overnight to Spain, Portugal, Ireland, and, perhaps, even Italy. So, the IMF, the Obama Administration and the ECB are all on board to further delay the reality of the financial and banking crisis through hyperinflationary measures. The idea is that the situation will take many months to fully play out, and Obama and his re-election team hope that the system will hold together past the November elections. Nobody's thinking long term anymore. If Jim's friend Harry Schultz is right, we're drawing into the final stages of a very dangerous game. For all the talk of crisis for the past four years, nothing's been fixed. Extend and pretend may finally be running out of room to run. Ruh-roh. I've used more than a few of the words on the official DHS priority keyword list. No wonder my blog had some government traffic last year. Haven't seen must evidence of DHS or White House visitors lately. I guess they either got bored with my posts... or they made like Romulans, and turned on their cloaking device. 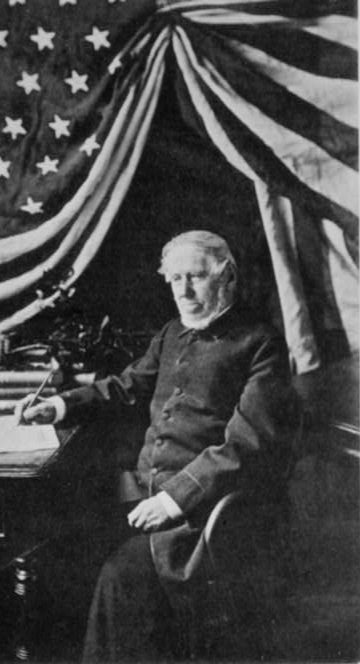 Samuel Francis Smith (1808-1895) penned the words to My Country 'Tis of Thee in 1831. It's Memorial Day. A day set aside to honor those who've given their lives in America's wars to defend our country and preserve its way of life. Take some time to remember those who've served and made the ultimate sacrifice. But also take a moment or two to remember defending our country and its freedoms isn't the exclusive domain of the military. Average, ordinary citizens have a vital role too. Be active in the affairs of your government. Hold it to constitutional standards. Do what you can to make this America the same land of liberty and individual freedom past patriots gave their lives to birth and defend. This past weekend, our server in Sweden was put under a "ping flood" Denial of Service (DOS) attack that at times resulted in 65% packet loss. The site appears to be functioning normally as of Monday morning. The Internet is a vulnerable platform. Those who take it for granted, and don't take steps to increase their own security or create redundancies, do so at their own peril. Redundancies for a home consumer can include having a back-up computer, as well as alternative means to access the Internet (wireless network card or dial-up) if your main service provider fails. A household back-up can also be as simple as having a smartphone. Copy-cat? Or directly related to one that targeted a California blogger? The latest one targeted Erick Erickson, chief editor at Red State and radio show host at WSB in Atlanta. I want women to control their own health choices, just like I want my daughters to have the same economic opportunities as my sons. We’re not turning back the clock. (Applause.) We're not going back there. Is the president losing it? Or is the White House and his campaign staff so sloppy they're inserting fictitious children into stump speeches? One other possibility. Obama's family's more extended than we know. Mr. Obama says some strange stuff when he's campaigning. Remember 57 states? The same Barack Obama who once wanted to strip the US Treasury to jack-up foreign aid disbursements now demands Mitt Romney repatriate cash Romney has in foreign banks and other overseas holdings. Mr. Obama apparently has no problem with Ben Bernanke and the Fed pumping billions of dollars into foreign banks. He just as a problem with Mr. Romney putting money overseas. If Obama's outrage is based on Romney's use of legal tax loop-holes, why does Obama do the same? C'mon Barack, Mitt's just doing what you want. When you spread the wealth around it's good for everybody. There's a lot of folks out there storing up freeze dried foods, guns, ammo, and stuff like solar panels to recharge their iPods. But how many really have any idea what going through a societal collapse would be like? It would be far more gritty, far more evil than many dare to imagine. Prep as you like. But keep praying it doesn't happen to you or your loved ones. And don't fall into the trap of romanticizing this stuff. In the U.S. occupiers are experimenting with new techniques of nonviolent protest inspired by the Black Bloc. How many people equate Black Bloc with non-violence? Officials said it was bands of Black Bloc protesters that ran wild in Seattle on May Day, forcing the mayor there to invoke expanded police powers to allow confiscation of potential weapons to counter the escalation. There was also a Black Bloc march in San Francisco's Mission District on April 30th. There's video from the protest posted on YouTube. The Occupiers seemed pleased with their NATO summit protests. But how many others outside Chicago even noticed? In Washington, the GOP seems to be afraid of Eric Holder's shadow. And how much longer can government elites prolong the idea that economies are growing their way out of recent turmoil? We go live starting at 1:00 pm EDT on TalkSouthRadio.com. Update: We didn't get to the GOP/Holder topic this week, we'll save it for a update next week. But there's plenty of other stuff we worked into this week's show. It's now in replay at the link above. Or you can play the May 24 show on-demand by clicking here. The media is an echo chamber for people who work in the media. Its greatest reach is internal, within the complex of people who live or work in a few major cities within the publishing and broadcasting industries. Beyond them is a great void of purple mountains that they occasionally report on but have lost contact with. I often think about the changes I've seen in news biz in my lifetime. It wasn't much more than a generation ago that many in the media rose through the ranks. It was still a journeyman type profession. 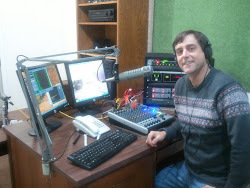 You might have had a college degree, or were just short of one, when you took that first news gig at a radio station or small newspaper. Some even got their start right out of high school or the military. Once you took the job, you were schooled on the job by an editor or some other old-school mentor. Reporting was a grassroots experience. Now those on camera and those behind the scenes are more akin to an elitist collective. They boast advanced degrees from the most desirable J-schools, often 'rounded out' by summers abroad or studying under media fellowships in foreign countries. The media no longer seems to dig to unearth the truth. It acts as if it already knows the truth, and just needs new stories to convey its preexisting notions to you. But at the same time, this truth can't go too far afield from the audience's preconceived conceptions. So much of what's now delivered as news is chosen because research shows it's simply what the audience wants to see or hear. The idea being, feed 'em what they want, and the audience will keep watching or reading. It's hardly seems a path to enlightenment. Seriously people, do you realize how much America has fundamentally changed? Welcome to the new America, where law enforcement, local and national, appears to vigorously pursue the Obama vision of a civilian national security force that's just as powerful, just as strong, just as well funded as the military. When Barack Obama ran for president in 2008, he made a special pitch in Kentucky. He told voters there he was a man of faith. A special campaign flyer was printed to drive home the point. Mr. Obama was standing in a pulpit, the cross clearly visible in the background. But once Mr. Obama became president, strange things began to happen. Georgetown University, a Catholic institution, was asked to cover religious symbols when Mr. Obama spoke there. Then the president began omitting references to the Creator when quoting from the Declaration of Independence. Today, the Obama administration wages war on Catholic institutions, demanding they provide free contraception through employee insurance plans even though such coverage violates teachings of the Catholic Church. 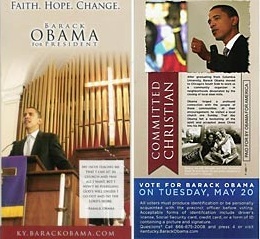 Mr. Obama's campaign didn't re-use his Committed Christian flyer leading up to this week's Kentucky primary. But I suspect many a Kentuckian remembers how he played them in 2008. Mr. Obama's overt Christian pandering of four years ago is likely just one of the reasons more than half the counties in the state chose 'undecided' over Barack Obama in Tuesday's 2012 Kentucky Democratic Presidential Primary. Their core constituency is watching. Yet the Republican Party that promised in 2010 to put Barack Obama in check if given the House now appears to cower in fear, afraid of Eric Holder's shadow. 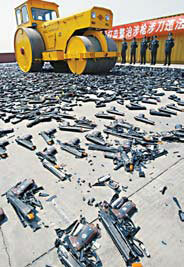 Thousands of guns went to drug cartels in the Fast and Furious fiasco. Hundreds of people may have died as a result. And a Republican dominated House Oversight Committee can't muster the votes to demand access to documents that might tell us how it came to be? Go ahead, Republicans, after more than a year of investigation, back down now. Show us you're as bad as the Democrats who've worked feverishly to keep a lid on this scandal. You'll dodge a fight. But there's gonna be a bunch of people who suspect you were just playing politics all along. And there will be others of us who know that when you had the chance, you simply failed to to the right thing. "The medicine is killing the patient"
Farage is a member of the European Parliament representing South East England. No .40 caliber kits? Maybe DHS already has those stockpiled. What's to blame for Rush Limbaugh's ratings 'tumble'? The left is just plain giddy today. It cries victory. It believes Rush Limbaugh's ratings have tumbled since the Sandra Fluke controversy. Limbaugh's detractors attribute the losses to a rejection of the show following his controversial comments about the Georgetown law student. I suspect we're just seeing a seasonal audience shift. Radio listening habits shift with the seasons. For example, things like weather reports and storm warnings draw big audiences to News/Talk stations in cold winter months. When warmer weather arrives, audiences tend to get a bit of spring fever and often swap some of their News/Talk listening for peppy music programming, at least for a spell. Libs trying to give one woman credit for a seasonal phenomenon shouldn't surprise anyone. It's sort of like their obsession with blaming people for global warming. So just chalk up Rush's spring numbers to climate change. The natural, cyclical kind that seems to bring the same result each year about this time. 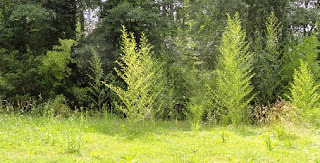 Do you have any idea what can happen to a backyard in Georgia in spring when you don't mow for three weeks? Three foot weeds and nine foot bamboo can take over just that fast. Knockin' 'em down with a riding mower is not a problem. 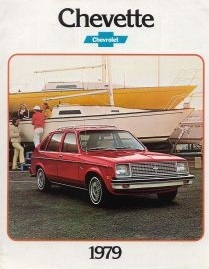 But how would you deal with this if you didn't have a gas-powered option? When I was a kid, my grandma had a scythe to clear paths. Sometimes we even used it to clear a whole field. I don't ever recall seeing one in a store. How many people today even know what a scythe is? I had opportunity to shoot a new, fresh out of the box Kel-Tec P32 last week. After a quick inspection and a light cleaning, I was ready to go. Overall, I found a lot to like. 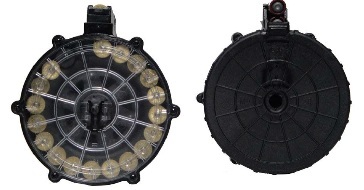 I detected only light recoil with the Kel-Tec shooting .32 acp rounds. It didn't seem nearly as rough on the hand as the much fatter and heavier Beretta Tomcat .32 which I'm more familiar with. 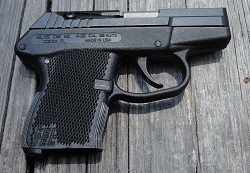 The Kel-Tec was easily shot single handed, as well as the more traditional two hand shooting stance. So many light pistols feel like they want to jump out of your hand. Or fly off target. Not this one. I won't get into all the details, but I did find the Kel-Tec to be a picky eater. Using ammo from over half dozen makers, I had good performance with Remington MCs, S&B FMJs and Fiocchi FMJs. A very limited test with Federal Hydra-Shoks went well, but Cor-Bon JHPs had some failures to feed in the initial break-in period. I also had a few failures to fully eject empty casings using Prvi Partizan FMJs. Again, this was with a new stiff pistol. After shooting, I had stumbled upon on something else. When clearing the loaded gun, most FMJ rounds got hung up and wouldn't eject when manually working the slide (Yes, I gave the slide vigorous pulls). Fiocchi's did okay, but the other brands wouldn't pop out. To clear a lodged round, I had to push it back into alignment with the barrel and, with my thumb, push the round down and out through the empty mag cavity. The problem persisted after a field strip and good cleaning. I carried the gun in a pocket holster for a couple days. I could hardly tell it was there. It's light enough that it doesn't cause the pocket to 'sway' like the Beretta does. After a few hours, the Beretta also starts burning my leg from all the weight rubbing. Not a problem with the Kel-Tec. Aside from being finicky about ammo, I was pretty much impressed. Several people have recommended Winchester Silvertips for the P32 but at $35 to $40 a box, I'll hold off. We'll keep breaking it in with Fiocchis. But any suggestions how to make this pistol less finicky would be appreciated. Meanwhile, I'll be shooting Kel-Tec an email to see what they suggest. The good news, I've tried cycling the troublesome rounds through another P32 with no hang-ups. At some point, I'll do a side by side comparison of components to see if I can find a difference between the two pistols. 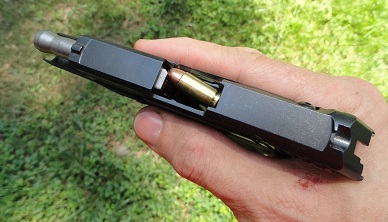 Meanwhile, my work-around for the first gun is to either use Fiocchi FMJs, or to load a slightly shorter JHP round at the top of the magazine to serve as an easier-to-eject chamber round. Tried out the second pistol with all the ammo types cited above. Every round fed, fired and ejected properly. Every variety also easily ejected by hand. Test consisted of approximately 300 rounds in one session. No hand fatigue after all that shooting, this is a pistol I'll enjoy practice with. I still haven't figured out what the difference is between the two guns. Philip Klein has a new e-book. "Conservative Survival in the Romney Era"
Conservatives embraced a team mentality when Republicans last held power under President Bush and the size and scope of government exploded as a result. With an unsustainable welfare state propelling the nation toward an inevitable fiscal crisis, the United States cannot afford for this to happen again. It is one thing for conservatives to vote for Romney over the much worse President Obama, but it’s another thing to refrain from criticizing him when he does violence to conservative principles. I agree with Klein. Romney is, at best, a stop-gap candidate to stop Obama's push to fundamentally change America. And Klein's right, Republicanism doesn't necessary equate to conservatism. I've blogged before how Mitt Romney could be a weak protector of conservative principles, if not an outright advocate for progressive ones. But I've also seen how Obama has become more radical as he campaigns for re-election. And in Obama's own words, he'll have more flexibility to pursue an even more unpopular agenda if given a second term. If Romney's the best shot at removing Obama, so be it. But his lack of solid conservative pedigree means he must be held accountable. And it also shows the need for conservatives to put strong emphasis on vetting and supporting right-thinking candidates for the House and Senate in November. And it apparently had nothing to do with NATO. It appears a group of violent anti-racists chose to attack a group of white nationalists while the nationalists were having lunch at an Irish pub in Tinsley Park, Illinois. Hammers and clubs were the chosen offensive weapons of the day. Media reports indicate a statement claiming credit for the attack was later posted on the anti-racists' website. The Chicagoist has one telling of the story with various additional links. Gateway Pundit also has a compilation. The attack sounds more like the kind of tactics used by Italian Fascists against the Communists during Mussolini's rise to power than something I'd equate with American anti-discrimination activists. Was this an isolated incident? Or a warning sign of where America's heading? One other question: Will Eric Holder and the Justice Department act decisively to investigate this incident as a hate crime? A federal judge in New York has issued a temporary injunction blocking portions of the National Defense Security Act which appear to allow the military to indefinitely detain U.S. citizens. Last month, the Virginia General Assembly passed a law that would prohibit state agencies and employees from participating in military acts to detain civilians under the federal NDAA. Just curious. Does Congressman Allen West (R-FL) still contend there's nothing in the NDAA to worry about? Why would a federal judge issue an injunction against something West says doesn't exist? Democrats were outraged last week when they learned of a memo where a Republican consultant described Barack Obama as a Metrosexual Black Abe Lincoln. "Barack Obama has never been shy about comparing himself to Abraham Lincoln." "I mean, we have kind of a metrosexual president … that doesn’t go over well in the small town. And it’s just cultural. It is what it is." But it's odd that Democrats seized on terminology and charactizations they've been using, often touting, themselves. Or was it the consultant's memo bottom line that worries 'em most? A push to highlight Mr. Obama's own record of failure by way of a renewed targeting of his past ties to controversial theologian Jeremiah Wright? It sounds like Dems may be worried that some of the stuff that got an easy pass in 2008 might get some real scrutiny this go-round. And if so, Jeremiah Wright may only be the beginning. Don't expect any economic break through for Europe. The bunch at Camp David seems to focus on the same type 'fixes' that keep failing. Our own Treasury Secretary Tim Geithner seems to be celebrating what he sees as some leaders taking a softer tone. We're about four years into a progressing economic crisis. Europe especially is losing ground fast. Timmy thinks a softer tone is gonna make things better? That's a huge part of the problem. Years have been wasted on Band-Aids, so-called solutions that only patched things up long enough so that the public didn't connect the dots about how bad they were. President Obama's advice to Europe seems even more disingenuous. Mr. Obama's telling Europe to ease up on austerity and focus on economic growth. Problem is, growth's about as real as Obama's shovel ready projects were when he promised they'd revive the American economy in 2009. And so the decline continues. The only question seems to be, when does the next sub-crisis take us another hard-step down? The strategy of the Obama administration seems to be to delay recognition of the reality until after the November election. But as troubles keep mounting, more people are taking notice that things really are getting worse at home or abroad. 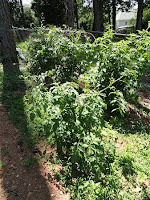 Here's a quick veggie garden update. We'd tilled a bigger space than last year's, but other stuff in our lives kept us from getting seedlings started and stuff in the ground in a timely manner. So I confess, we're mostly growing from plants bought from Lowe's or Home Depot this year. Everything's been out about a month now. We've had some dry spells, and have only watered sporadically. 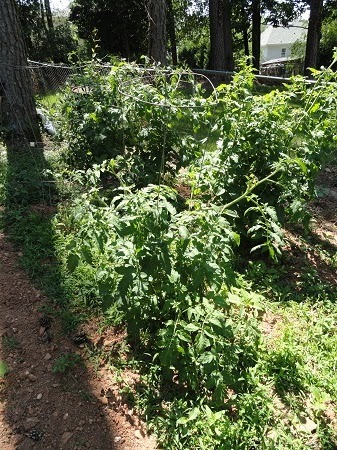 But the tomatoes are quick-climbing toward the sun. We've already got a bunch of greenies on the vines. Squash, zucchinis and green bell peppers are part of this year's mix. And we're trying a few watermelon vines too. 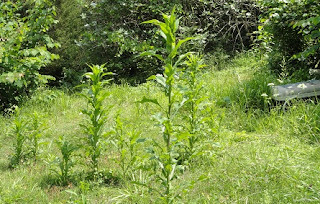 We stick with stuff we hope wild rabbits won't eat. On a lark, I sewed a few short rows of corn seed in an area that probably doesn't get near enough sun. We'll give another update in a few weeks. I'm still tempted to dig another small plot or two and put some additional stuff out. Last year, we were harvesting tomatoes well into November. And eating what we picked until around New Year's. If necessary, the House will act to fulfill our Constitutional obligations in the coming weeks. Still doesn't sound like there's a lot of urgency here. 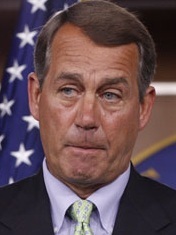 You'd think everyday would be a day where GOP leadership sought to fulfill its Constitutional obligations. So far, there have been four arrests in connection with the beating of the two newspaper employees in Norfok. Three of the suspects are 16. The forth just 13. According to the Virginian Pilot, police won't say if more arrests were expected, but say their investigation remains active. Supreme Court Justice Stephen Breyer is no exception. Someone broke into his DC home and made off with some goodies. It's not the first time he's been a crime victim. I've seen what appear to be escalating crime stats in some neighborhoods I watch. Do you monitor what's happening close to your home? NBC News is reporting that's what the autopsy concluded. And a lot of other media have picked it up, without defining what "intermediate range" would be. ...the medical examiner's report says there was a soot ring abrasion and a two-inch by two-inch area of stippling. this is a gunshot residue expert and the chief medical examiner in bekxar, texas. >> it's emerging from the muzzle of the gun. based on the size of the pattern, the range was most likely between two and four inches. MSNBC's re-write of the story for general web consumption didn't include the proximity details in the original NBC report. Why not? USA Today also picked up the NBC story without defining "intermediate range," and apparently overlooked how NBC chose to refine use of term in the telling of its original telling of the story. The left's latest push for mass protest seems to draw smaller numbers than expected. Don had an idea this would happen. We'll give it a recap. Meanwhile, the Obama team seems to escalate its strategy of cultural divide. Will it work? Or is the campaign falling victim to its own group-think, and pushing away more supporters than it draws in? And Democrats seem to have mounting worries they've already bungled their national convention. If the left sees its various attempts at creating mass movement faltering, and its overall popularity falling, does it have a back up plan? We'll get into this today at 1:00pm EDT on TalkSouthRadio.com. You can directly access the audio stream here. The Obama team rewrites White House biographies of dead presidents to insert mentions of Obama to tout his greatness. Are you feeling at least a tad more uncomfortable after reading this? When Stephen Lerner has to come out and practically beg college students to get arrested, it tells me the left's not attracting the level of commitment or the numbers necessary to pull off its grand scheme of massive protests. At Georgetown last month, Lerner told a class they must all vow to be arrested in the coming year. How many will jump at the chance of an arrest record just to fulfill an aging Leftist's fantasies of revolution in the streets? Look what sneaked through Congress this year: H.B.347, The Federal Restricted Buildings and Grounds Improvement Act of 2011. Sounds nice, eh? Who would be against improving federal buildings and their grounds? The forthcoming summit of the North Atlantic Treaty Organization, set for May 20 and 21 in Chicago, could be the first public test of H.R. 347, the recently passed law that expanded the ability of the Secret Service to suppress protests in or around certain restricted zones near individuals under its protection. We've written about H.R. 347 here and here. The law is a true bipartisan creation. Cooked up and passed in the Republican controlled House, it was also approved by the Democrat controlled Senate, and signed into law by President Obama in March. Some call it the anti-Occupy bill, but its provisions might just as easily be used to silence a Tea Party protest outside a protected candidate's rally. And it moved right through the Congress and into law without so much as a discernible hint that conservatives raised questions or voiced protest. "I am entirely persuaded that the American public is more reasonable, restrained and more mature than most of our (television) industry's program planners believe. Their fear of controversy is not warranted by the evidence. I have reason to know, as do many of you, that when the evidence on a controversial subject is fairly and calmly presented, the public recognizes it for what it is--an effort to illuminate rather than to agitate." 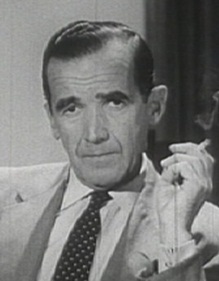 Pioneer television journalist Edward R. Murrow made that statement in 1958 in addressing the Radio and Television News Directors Association in Chicago. Are the American people as reasonable and restrained as they were then? Is the American media willing to give up its recent binge on inflammatory spin, and return to a more balanced, thoughtful approach in news coverage? "For surely we shall pay for using this most powerful instrument of communication to insulate the citizenry from the hard and demanding realities which must be faced if we are to survive. I mean the word survive literally." Smart guy, that Mr. Murrow. Less spin, and more honest, factual, balanced reporting might go a long way toward resolving today's societal rifts. But don't expect it to happen. Today's news outlets know their audience through tons of research, and they're far more likely to do things to provide that segmented audience with biased reinforcement and instant gratification rather than risk losing it by offering what Murrow called fairly and calmly presented content. Does censored news serve in the public interest? Recently, Kyle Rogers at Examiner.com caught a South Carolina TV station reporting the race of a white burglary suspect, while omitting race in a similar story involving a black one. People are catching on to the media code. But should people really have to work at deciphering the news to know the descriptions of people committing crimes around them? Seems to me, leaving folks to fill in the blanks with guesswork only fuels potential problems, especially when they know facts are being intentionally omitted. Many may even come to assume the problems they perceive are far more widespread than they actually are. The media already suffers a credibility gap with increasing numbers of the population. How much deeper will it allow the gap to grow before it returns to unbiased, uncensored reporting? A murder charge isn't enough? Is someone at the DOJ upset that the Trayvon Martin/George Zimmerman case has fallen from the headlines? According to an Orlando TV station, the FBI's looking into charging Zimmerman with a hate crime. A GOP aide also warned against a racial backlash if Republicans are seen as unfairly targeting the first black attorney general, who is serving under the first black president. “Especially after Trayvon,” the aide said, referring to slain Florida teenager Trayvon Martin. Hundreds of people are dead because, by some estimates, thousands of guns were allowed to pass across the border into the hands of Mexican drug cartels - all with the blessings of a U.S. federal agency that reports to Holder. Fast and Furious has been under congressional investigation for well over a year. If Holder continues to refuse to comply with requests for documents from a duly authorized Congressional oversight committee, it's past time Congress moves forward in a clear and decisive manner. Further delay will likely be cited as proof by opponents that the investigation Republicans started really is just a political witch hunt. Republican House leadership needs to show us now if it's serious about pursuing real answers in Fast and Furious, or if it plans to play the investigation as partisan game that will likely end up diminishing the party's credibility with voters across the political spectrum. Now see what led to Damon's conclusion: The whole 'toon is here. I think biographical stories on presidential candidates are fair game even if controversial incidents contained in them are far in the past. Of course we all change and mature. But these stories give clues to the character of the flesh-and-blood human beings we pick to lead us. Meanwhile, best I can tell, the Washington Post has never shown much interest in unauthorized biographical stories about the current president. The Post has failed to dij deep into President Obama's youthful affiliations and activities in the era when Obama himself says he aligned himself with Marxists in college. Or how about telling us more about young Obama's early politics while running on the slate endorsed by the socialist New Party in Chicago? With so many gaps in the incumbent president's bio, and so many of Mr. Obama's records sealed by his own deliberate actions, it's hard to believe the Post now justifies biographical stories because they give us clues to the character of the candidate. Biographical stories are indeed fair game. It's just that the Post seems to give selective attention. Why hasn't the Post taken more interest in Mr. Obama's past outside the president's carefully crafted authorized narrative? There's so much we don't know about O.
CBS Chicago reports five dead and at least twenty wounded by gunfire in Chicago this weekend. Another victim died from a beating. Is Occupy sure it wants to subject its people to this kind of war zone? Does NATO? The Taliban has trouble inflicting causality counts like this when it stages major assaults in Kabul. Is this alleged Anonymous video legit? May's about half over. Occupy backed out of shutting down the Golden Gate. I recall hearing rainy weather was an excuse for scaled back May Day activities in New York. Yes, I've seen reports of dozens of bank protests across the nation, but not thousands. Actual bank office closures? Likely in double digits, at best. Now the question is: Will Occupy and other others be able to pull off the scope and scale of demonstrations they've promised during the Chicago NATO summit and outside the G-8 at Camp David? Could be, many who watched (or even participated) in Occupy last year came to realize it was all grit, no glory; and want nothing to do with another round. People today are more interested in entertainment than they are in principle or sacrifice. Even among radicals, attention spans are short. When American capitalism didn't collapse in three weeks like Egypt's Mubarak government did, many Occupiers may have moved on. It's a sad fact, we've become a nation where most people seem to believe professional politicians are the ones best able to handle governmental affairs, and that they do it with our best interests at heart. In the past, the left effectively used conservatives' inattention and apathy to make great gains. Now it looks like the radical left is running up against the same apathy as it tries to push its presumed allies out into the streets. According to the Chicago Tribune, only about 200 people showed up Saturday to discuss plans to protest the upcoming NATO summit. The Trib did capture a nice snapshot of two images decorating a wall at Occupy headquarters. They show Chicago Mayor Rahm Emanuel and President Barack Obama apparently standing guard over the room, each is portrayed as holding a handgun. Even Governor Moonbeam can't put the shine back in California. Lawmakers and others were hoping that a rebounding economy would help the state avoid steep cuts to social services. But revenue in April, the most important month of the year for income taxes, fell far short of expectations, leading to a shortfall of at least $3 billion in the current fiscal year. California's deficit now stands at $16 billion. Many of the state's best and brightest have already picked up and moved on. "Three weeks ago, an Obama campaign website, 'Keeping GOP Honest,' took the extraordinary step of publicly naming and assailing eight private citizens backing Mr. Romney," Kim Strassel of the Wall Street Journal reported. "Titled 'Behind the curtain: a brief history of Romney's donors,' the post accused the eight of being 'wealthy individuals with less-than-reputable records.' Mr. VanderSloot was one of the eight, smeared particularly as being 'litigious, combative and a bitter foe of the gay rights movement.'" What's next? Obama people gonna slip out at night and paint a big yellow "R" on the windows and doors of Romney supporters' homes and their businesses? And it looks like the folks at Government Motors are about to serve up an Obama-era version of the Carter-era Chevy Chevette. 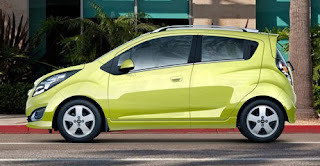 Have you seen the new 2013 Chevy Spark? Nigel Farage, a member of the European Parliament from South England, launched into a bit of a rant the other day. Any chance the Farage rant has application to what's happening in the U.S. as well? Has our own federal government become too powerful and so inefficient that it now pushes people and political parties toward political extremes? Perhaps a scaling back of the federal government (and its economic meddling), with return of more autonomy to the states, would help reverse America's widening political divide. Differences are often easier to work out when done in smaller steps, covering fewer people. Most reviewers panned Occupy's efforts surrounding May Day. We heard the word fizzle a lot. “American anarchists haven’t experienced this much positive public attention since the euphoria and aftermath of N30 in Seattle,” writes one commentator. For many, the Black Bloc represents a tactical innovation that suggests the future of Occupy. “Occupy is dead, long live the Black Bloc,” writes another. Adbusters touts the Black Bloc as a growing influence within Occupy, and says it sees it as pushing the movement in unexpected directions. Things have been mostly quiet since May Day. That could change with announced plans for protest surrounding the G-8 and NATO summits. Sadly, the Republican Party in Greene County, Virginia seems to cherish political correctness over Jeffersonian principles of liberty. The party, after taking some heat for an editorial published in a newsletter in March, issued a statement denouncing its reference to 'armed revolution.' Then, just two paragraphs later in the same statement, it repeats Thomas Jefferson's own words that seem very much in line with the sentiment expressed by their now defrocked newsletter editor. The new position of Greene County Republicans? Should Barack Obama win reelection, keep busy raising your families and paying your taxes. And put up with whatever the government sends your way. I don't advocate violence. I don't cheer a call to arms. I pray that such circumstances never come to this country. But when government knows the people have no will to resist, government will increasingly trample on their rights. We the people have done a rotten job setting boundaries for government in recent years and in many cases, government hasn't respected the ones we have set. Do we simply let the trend continue forever? 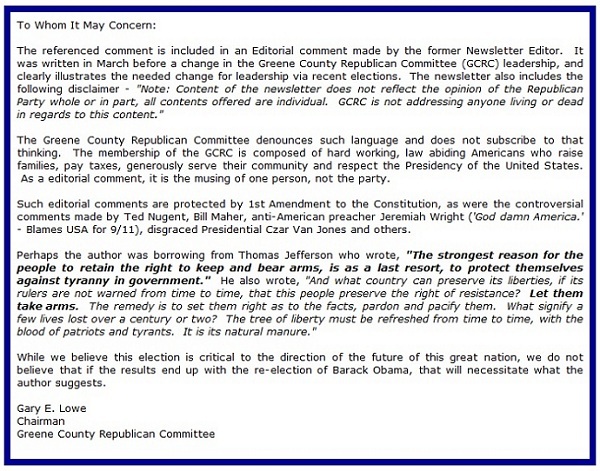 The Greene County GOP guys post images of the Founding Fathers including two of Thomas Jefferson on their website. Would Greene County Republicans have stood with these men in the revolution, or would they have denounced their rebellious voices and advised family and friends to keep paying taxes to the crown? In previous posts and programs I've mentioned the Chinese restaurant, the Arby's and the Burger King that closed on a strip of highway near my house. This week, Ruby Tuesday's went dark. That's four restaurants that vanished in about a two month span on a seven to eight mile stretch of high traffic highway. This is no recovery. It doesn't even look like a sustained bottom. I'll let you know if anyone else calls it quits. Ever read James Howard Kunstler? He knows we're on an unsustainable path. And he was on a roll with his blog post earlier this week. 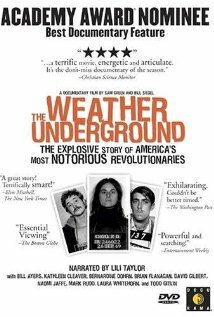 There's a documentary about The Weather Underground that's been around for a decade. Does it give us any insight into what left-wing activists are planning for 2012? The left is atither after a GOP newsletter in a tiny Virginia county mentioned armed rebellion. Conservatives reacted much the same way when a lefty advocated armed rebellion on national TV a couple years ago. Is such talk un-American, or is it exactly what a founding father said we'd need from time to time? Meanwhile, the president continues to show contempt for Congress, and seems upset it's not rubberstamping his 'to do list' in rapid order. Bush only joked about "a dictatorship would be a heck of a lot easier." Obama seems serious. The show runs from 1:00 to 3:00 pm, and then goes into replay shortly after 3:00. Click here for a direct link to TalkSouth's 24/7 audio stream. There's a line in President Obama's gay marriage pitch that's really hit a nerve. It has nothing to do with gays and everything to do with Obama's Ceasar-like attitude. "When I think about those soldiers, Marines, airmen, sailors who are out there acting on my behalf..."
How much longer will the American people let this arrogance continue? Members of our military have sworn to defend our country and the Constitution. Obama speaks of them like they're his personal pawns. Meanwhile, Obama raked in a cool million on his gay marriage spiel. And he did it in just 90 minutes. Tuesday's North Carolina vote set the stage. The LGBT community suffered an emotional sting. Obama's campaign knew they'd want to strike back, and was ready to capitalize on the emotional rollercoaster. So today, Obama rang the bell, and the gay community whipped out its debit and credit cards. Obama played 'em on cue. Just like Pavlov played his dogs. Now that Massachusetts Democrat Elizabeth Warren's tale of Native American ancestry is getting serious scrutiny, an ironic twist has been uncovered by those sleuthing her family tree. 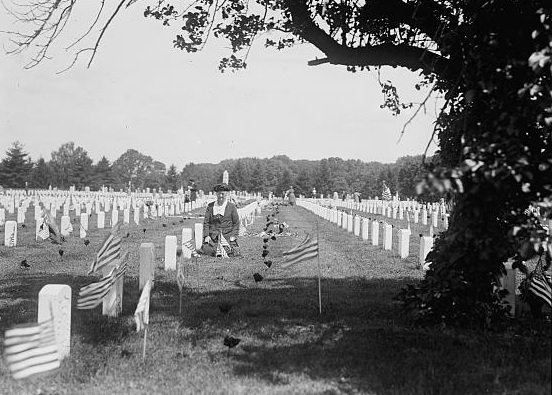 (T)he husband of Warren’s alleged Cherokee connection, her great-great-great grandfather, was part of a militia unit which rounded up the Cherokees for the Trail of Tears. In addition to the confirmation by a genealogist working with me who posted his findings at Breitbart.com yesterday, another genealogist has confirmed that finding as reported at The Boston Herald. Politicians can tell some whoppers, sometimes creating yarns a full one-eighty from the truth. We still have some real gaps in what we know about the lifetime of our president. The new enlightenment about Warren's claims going back twenty-some years makes me all the more curious what sealed records belonging to President Obama might show about his personal history. As of this morning, a Texas prison inmate is leading Barack Obama in eight counties as West Virginia counts votes from yesterday's presidential primary. As left-wing activists today tell us we're in an escalating phase of protest in America, the 2002 documentary The Weather Underground is well worth watching. Look for parallels between the rhetoric and goals of the radical left in the late '60s and 1970s, and those in the streets (or exhorting those in the streets) today. You'll also see a familiar face or two. The Weather Underground is available for instant play on Netflix, YouTube, or on Hulu through IMDbd.com. Where are members of the Weather Underground today? According to this decade old documentary, some still have high profile roles advocating for progressive causes or work with progressive organizations. Note: The Weather Underground contains strong language, sexual themes and includes graphic video. This is not one to watch with kids in the room. “The message here is if you have this kind of law that your federal funding is going to take a hit because they make states less safe,” said Adam Sarvana, communications director for Grijalva. Democrats are apparently the Party of Thugs. Update 9:28am 5/9/2012: Democrats yanked this one back. Any chance they ran a quick poll or focus group that told 'em it was political suicide? You know why this civilization is done? Because people are so narcissistic, deluded and dim that they absolutely cannot process that anything bad could ever happen to them. That is why the Obama regime, an oligarchy of a few thousand people at the very most, is going to steamroll over this entire, godforsaken country. And the people will SIT AND WATCH, completely unable to engage reality in any adult manner. How many people have any idea how many government rules and regs have been created or changed in the last three years? I actually know a bunch of folks who can cite at least one, and they can tell you how it made things worse for them. Are you ready for four more years of the same - or worse? ...Occupy Chicago is seeking space for 2,000 protestors, and says they’ll even accept space donations from Republicans or political conservatives, just so the protestors can avoid sleeping in parks, and avoid being arrested by police. What are the chances political conservatives will answer the Occupy call? Occupy's also seeking big spaces too, like churches or industrial buildings. Such a snappy tune. Great piece of PR boosterism? Or a sign Chicagoans remain in deep denial about what's really heading their way in less than two weeks? Rudimentary information from police crime reports are often available now on interactive maps designed for public awareness. These are great tools to help boost and target your situtational awareness. Try 'em all. See if one covers your community better than others. Some police agencies may be reported on one, but not another. Always good to know what's happening in your neighborhood. Helps you keep your guard up. Gives you some idea what kinds of circumstances you may want to prioritize in an effort to avoid becoming a victim. While most eyes are on Europe this morning, don't forget where own country's headed. We're playing our own round of what might be called Economic Jeopardy. Despite all the warnings and occasional lip-service, no one's seriously working to fix anything. They weren't last year, and they aren't now. Since RightChange and Politizoid kicked out its Economic Jeopardy cartoon in March 2011, the U.S. federal debt has soared past $15.6 trillion and it's still climbing. Now look at the leading presidential candidates. Just like Economic Jeorpardy's trio, Barack Obama and Mitt Romney are good about changing the subject. Each tells us he'll bring more jobs and better times. But neither really tells us how they'll take us there and who will pay for it. Any references to the federal debt are few and far between and, even if do come, are usually just a jab at the other guy rather than part of meaningful discussion. This year's election seems to boil down to who you want in the White House when the next economic disaster hits rather than picking someone to fix things before it happens. And I don't really think either side is even planning for that. We've squandered years of opportunity. Prepare for a hard landing. Loosening lug nuts may sound like a prank. But loose lug nuts can also cause fatal wrecks, putting officers and civilians at risk. The Chicago Tribune reports at least four squad cars have been targeted. Imagine being in high speed response mode and suddenly a front wheel comes off. What was a police car is suddenly converted into an uncontrolled missile. What if there's sidewalk crowded with kids nearby? I came by the lug nuts story via Second City Cop blog. SCC is kind of raw, often un-vetted, window to what's happening in Chicago as the city counts down to NATO's visit. The comments that follow SCC posts are often the real eyeopeners. She can't help it. She was drawn that way.